I sometimes leave one of my trained watch dogs with Mum so she won't feel nervous at night. 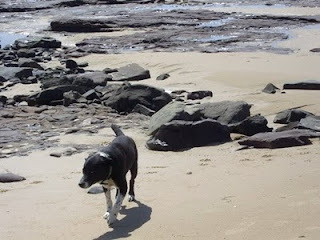 This afternoon Mum came with me while I walked the dogs on the beach. As I was taking the dogs home I asked if she wanted one left at her house. "No, just every second night will be enough," she said. So I dropped off the dogs and I left her at her house. At 5.30 pm, the phone rang. It was Mum. She said, "When are you bringing the dog over? Don't leave it too late." I was already in my pyjamas and not feeling too well. I explained that she said she didn't want the dog. She said, "I'm terrified. I can't stay here tonight without a dog." I told her to ring my son and ask if he would come and get one of the dogs and take it over there. She couldn't get on to him. She rang again. And again and again. I said "Mum, take some of your medicinal brandy in a glass of milk and go to bed. That will help you sleep." "No, I am too frightened!" "But there's no-one out there!" And so it went on. Ten or more phone calls and demands for a dog. I couldn't do it. I was exhausted and sick. I didn't feel up to driving the car. I suggested she get a taxi and come over and sleep at my place. I don't want to start her doing this, as I need my twelve hours of peace every day, but I couldn't see a way around the problem. It is nearly midnight. She hasn't turned up. I took the phone off the hook and turned off the mobile phone. Sometimes I wonder how much I can take. Where will it all end? 2003: was that where it started?